With 27 acres of indoor exhibit space, over 850 exhibitors and more than 300,000 attendees, the National Farm Machinery Show (NFMS) in Louisville, Kentucky, is the place to be if you’re wondering what’s new in agriculture. Billed as the largest indoor farm show in America, the NFMS showcases new products, technologies and services that today’s producers are seeking to maximize their farm’s productivity and efficiency. The four-day show ran February 10-13 and was held at the huge Kentucky Exposition Center in Louisville. Paulsen staffers Kristi Moss, media group director, Tori Toering, account specialist, and Greg Guse, EVP, industry analyst, attended the show. All agreed it’s the place to be for all things related to agriculture. According to Paulsen’s industry analyst, the National Farm Machinery Show not only highlighted hundreds of impressive ag equipment and product exhibits, but also featured a number of informative educational seminars. “You can tell that farmers today are hungry for information to help them maximize their productivity during the upcoming growing season. I was certainly impressed with all this year’s show had to offer,” he added. Farm Journal’s weekly television program “U.S. 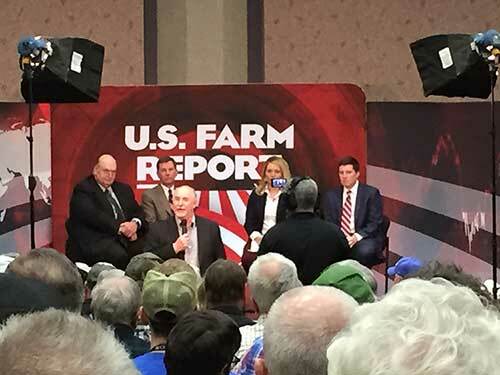 Farm Report” was recorded before a standing-room only audience during the National Farm Machinery Show. Paulsen client Kubota Tractor Corporation had a major presence at the event, showcasing their complete line of sub-compact, compact and mid-size tractors, mowers, utility vehicles, skid-steer loaders and forage harvesting equipment, including the new BV Series balers.